We are very pleased to anounce, that REV-MED received the new CE Certificate for TriCell PRP and EN ISO 13845:2016 certification for the full quality management system. REV-MED had to change the its notified body and is now accredited with TÜV Süd Product Services GmbH from Munich, Germany. We are delighted to announce the release of our new TriCell brochure. 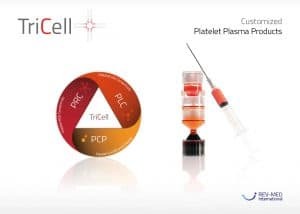 The brochure is designed to provide an overview and insight into the TriCell PRP Kit and demonstrate the range of clinical application experience for various plasma products available. Please click on the image below to view and download.